Well, I felt it was about time to get a blog up and running. Everything I've learned on the subject of digital forensics has been a direct result of reading forensics books, blogs, and list-serv responses written by people like Ken Pryor, Harlan Carvey, Eoghan Casey, Lee Whitfield, Brad Garnett, David Kovar, Andrew Case, Rob Lee, Dave Hull, Dan O'Day, Shafik Punja, Frank McClain, Cory Altheide, Joe Garcia, Hal Pomeranz, *deep breath* Troy Larson, Andrew Hoog, Eric Huber, Luby Novitovic, Michael Hale Ligh, Alex Bond, Jimmy Weg, Corey Harrell, Dan Farmer, Larry E. Daniel, Jamie Levy, Tom Yarrish, Andreas Schuster, Loc Nguyen, and many more (I know I've forgotten some; I apologize in advance). So I just wanted to start off with a quick 'thank you,' as you've all driven me to this point. Your work is very much appreciated. [UPDATE #01 03/15/2016]: A new AppID Master List has been created. See this post for more information. Before I get into the bulk of this post, I'd like to divert your attention to Harlan Carvey's research on Jump List Analysis [part 1] [part 2]. Much of what I'll be covering here is detailed within these posts, so make sure you take a look at them. I just don't want to repeat what's already been said; Harlan does a great job of explaining the concepts. You can also check out the list of references at the bottom of this post to get your Jump List and AppID info fix. Just to preface the AppID findings, I'll shed some light on what a Jump List actually is. Remember, check out Harlan's posts and the references section for more detail. 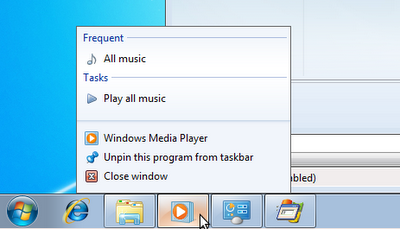 Windows Media Player's Jump List. Right-clicking the icon displays this. Note: these directories are hidden. You have to type in the full path in the address bar to see their contents. The '*' in the above examples is where the Application ID (AppID) is represented. For the most part, the Windows operating system calculates the AppID of an application. Knowing an application's AppID can help identify any given application when user activity is of great importance in an investigation. The forensic research on Jump Lists has been greatly undeveloped until recently. Luckily, we've seen some activity and tools created to parse Jump Lists, as they are some of the most valuable resources in analyzing user activity. All applications are 32-bit. Tested on Windows 7 Professional SP1. Note: Several versions of the same application were tested in many cases; just because it's the same application doesn't mean it will have the same AppID. There are a few things to consider when analyzing Jump Lists. Throughout my testing, I noticed that installing an application to a non-default location results in an AppID change. That is, if the application's developers did not provide a custom, static AppID and the installation directory is different from its default location, the AppID will be different from what is listed above. This clearly indicates that the AppID is calculated using the path from which the application is run (amongst other conditions). For example, when I installed the Opera browser into C:\Program Files\Opera, its AppID was calculated as 16ec093b8f51508f. When I installed it in C:\Program Files\Opera2, its AppID was calculated as e23869c0afb61102. We already knew that the path from which the program is run was a factor in how the AppID was calculated, but it's an important aspect to reiterate. This means that portable applications will rarely have a definitive AppID unless they are being run from the same drive letter and path as they were when initially executed. While this is unfortunate, there are solutions. For example, we can take a look at .lnk artifacts created upon the file's opening to find the drive letter and path to the file/application in question. Another place to look would be at the prefetch files in order find more information on the portable application (beyond the scope of this post). The great thing about having a quasi-though-not-nearly-comprehensive list of AppIDs is that you could potentially find exactly which version of an application was running. For example, say we have a portable image viewer (STDU, for instance). If we run it from a USB flash drive, it will generate an AppID based on the file's path (among other things). We can take a look around the system to find other artifacts and place them all in a timeline. We analyze the timeline to find when the flash drive was inserted and used, analyze the timeline items around that time, determine the name and path of the application, download different versions of that application, run each version from the location we just discovered, and compare the AppID to the initial evidence AppID. I have tested this and confirmed that this is indeed possible. While this is a very roundabout way of finding out the application version, it's still a viable option -- not ideal, but viable. UPDATE 4/30/13 If you haven't looked at @Hexacorn's blog post on AppID and Jumplist filename calculation, be sure to look at it. It sheds light on the way AppIDs are calculated. There will most definitely be a followup post to this one. I've focused upon browsers, utilities, image viewers, and media players thus far. I'll be focusing more on file-sharing, communications, and file-transfer clients in the next installment. Of course, some of that software doesn't utilize Jump Lists as much as the software listed in this post (recent files for an IRC client? I don't think so...), but it's still important to know how to identify them and their artifacts, as jump lists are created simply as a result of a right click of the taskbar. Please leave some feedback on this post if you've got the time. I would love to see some people correct me on some things; I won't bite, I swear! In any case, thanks for reading and keep an eye out for Part 2. Great post, Dan! IMO, you should post some of this info to http://forensicartifacts.com/. Thanks for the "thanks," too. I echo Little's Mac comment. Thank you for the shout-out and I look forward to reading your contributions to the DFIR community! @Little Mac @Brad4n6: Thanks, you guys. I'll definitely get this info to forensicsartifacts along with the followup information. Glad you enjoyed it! One easy way to check the AppID for your specific target is to boot a VM of the image and run the apps in which you have an interest. Then check for the Jump List files that were modified or examine the Jump List files to locate the files that you opened with the apps. Thanks, Jimmy. Your response on the win4n6 list-serv about apps used in CP cases really got me thinking on this AppID business, as well. I think this information would be most valuable for those types of investigations, but would serve well in general, too. Is ace2e449a5dfce37 is event viewer? @Anonymous - I suspected the AppID was a CRC64. How did you find that out? If you haven't looked at @Hexacorn's blog post on AppID and Jumplist filename calculation, be sure to look at it. It sheds light on the way AppIDs are calculated. I'll definitely get this info to forensicsartifacts along with the followup information. I do not pretend to understand the jargon above, in a layman's terms, Is it possible to simply copy the Automatic Destinations from a windows 7 system to a new install windows 8? See the "About" tab at the top of this page.